Find hotel near Caow Eng Bio Chinese Budd .. 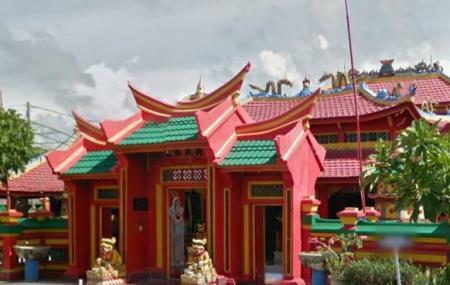 Dedicated to the Hainan goddess Shui Wei Sheng Niang and the 108 Brothers., this ornate and brightly colored temple at the very tip of the peninsula at Tanjung Benoa is one of the oldest Chinese temples in the region. It also has shrines for the sea deity Mazu, and the male deities Guan Gong, Nezha and Monkey God. It is thought to be 300 years old. The traditions practices here lean more towards Chinese than Buddhist. The middle room is for praying. You will find some wise saying inscribed in Indonesian and Chinese. Feel free to make a donation for a blessing. The temple is at its liveliest during the Chinese New Year and the Vesak. How popular is Caow Eng Bio Chinese Buddhist Temple? People normally club together Air Sanih and Kuta Square while planning their visit to Caow Eng Bio Chinese Buddhist Temple. People also prefer to start their day with Caow Eng Bio Chinese Buddhist Temple. When travel, i am always searching for new place for "pai-pai(read:pray)" . When in Bali, you must visit this temple, because, it is one of the oldest temple here..
Оригинальный храм. И вообще прикольный райончик. Приятно погулять по его узким улочкам, посидеть в кафешках с видом на пролив и большие корабли.